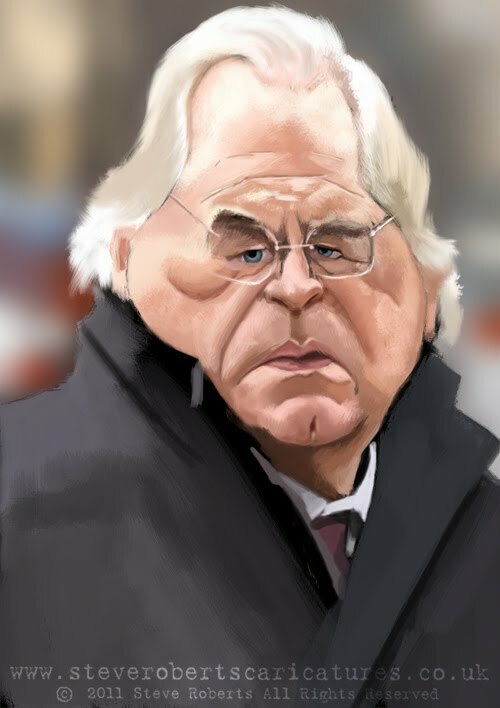 I've noticed a lot of caricature artists posting work on various art sites and blogs that they have created for Caricaturama Showdown 3000 on Facebook and I've decided to take part myself. 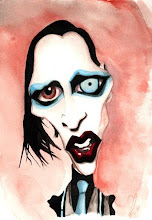 Now, I am something of a Facebook virgin, I do have an account, I even created a page for my caricatures all under the persuasion of friends and family, the problem is that I don't know what the hell I'm doing and to be honest ... I'm not quite sure that I get it. It just seems like a lot of random comments and abbreviations ... LOL ... OMG, etc, etc. Oh well, nothing ventured and all that. 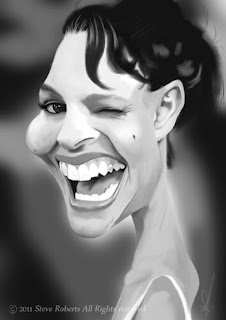 By the way this weeks Caricaturama Showdown 3000 subject is Natalie Portman and this is my attempt. This my entry for this months Wittygraphy contest. 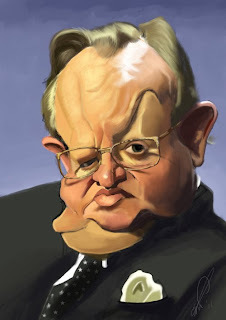 This fine looking fella' is Martti Ahtisaari who, and I quote "is a Finnish politician, the tenth President of Finland (1994–2000), Nobel Peace Prize laureate and United Nations diplomat and mediator, noted for his international peace work". Admittedly I have never heard of him but he was good fun to work on. 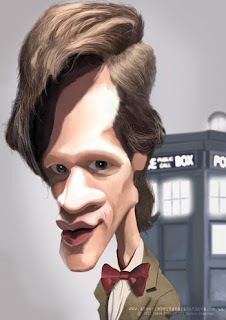 To celebrate the return of Dr Who next week here's a painting of the current Doctor, Matt Smith. I originally posted the drawing for this painting way back in August 2009 with the intention of painting a Dr Who timeline which I never got around to (sorry) I really will try to find the time to do it, I think it would make a great painting but for now here's the 11th Doctor and his beloved Tardis. 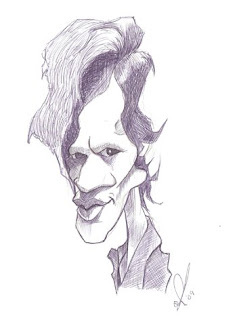 A caricature of the actor Brian Cox. I haven't gone for the high polished detailed look, I've tried to use quick broad brush strokes to keep the image looking like a painting. 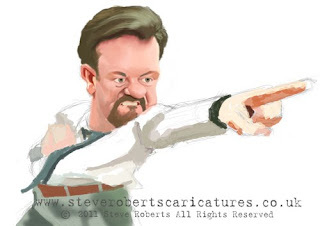 This caricature TV moment stars Ricky Gervais as David Brent from the original BBC version of 'The Office'. 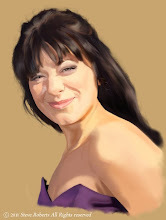 It's still very much a work in progress and I'll post the finished version later this week (time allowing). I rewatched 'The Office' earlier this year on DVD and enjoyed it immensely, Brent's (Gervais) 'dance off' is quite possibly the most cringe worthy moment in TV history ... absolute comedy gold. 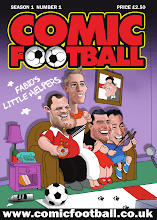 If you havent' seen it there is a clip available to view here. I was asked to do a quickie job earlier this week for a wedding card. 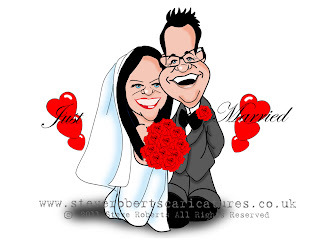 A cartoon, cute and simple design of the happy couple, having recently been told that my caricatures sometimes are a little sinister I jumped at the chance to do 'cute'. I've never really done cartoon work before and I must admit I quite enjoyed it and would be quite happy to do more of this style.